Please do not post to the Showroom address, your return may not be received, use the PO BOX address on your return form found on the back of your invoice. We hope you are delighted with your order however we understand sometimes things just are not right which is no problem. Make sure your item/s are received back to us within 14 days of your receipted delivery date. Full priced items can be returned for a refund or web store credit of your product/s purchase price. Permanent sale or clearance lines We do not refund these lines for incorrect choice, change of mind. These items are noted in the first line of the product description where they can be returned for a web store credit or final sales are all sales final. Want To Exchange? if you want an exchange tick store credit or eligible items for a refund on your return form and place a new order as we are no longer able to process exchanges. Did we make an error? Please use the contact us page or email us before sending your item back so we can rectify this for you. All items must be sent back in the same condition sent without signs of wear, pet hair, deodorant marks, perfume or washing odours etc. garments returned in this manner are unsaleable and will not be processed. We do not refund postage charges. How To Return – On the back of your invoice that comes with your order is your return form, fill it out, pop that with your item/s into a post bag, affix postage and send to the returns address on the return form (Do NOT send to showroom address) If you want to pop in to our Penrith showroom, returns must be received also within the 14 days of your receipted delivery date. If you paid with PayPal you can claim your return postage find out more here. 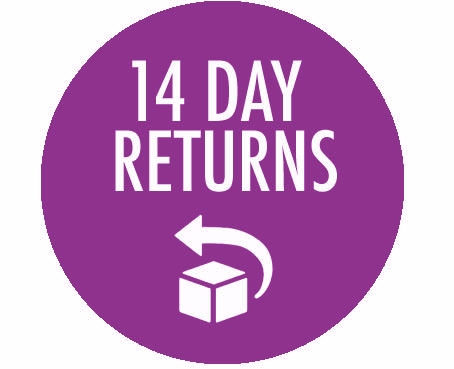 Returns paid with Afterpay – We cannot refund in store, Afterpay orders must be posted back for refund processing, if you are local however and would like an exchange we are happy to do this for you for orders returned within 14 days to store. Orders placed on Afterpay eligible for a refund are processed via Afterpay and they will adjust your payment schedule. Orders eligible for web store credit means your Afterpay schedule remains the same. Returns On Promotions - Where clothing is purchased with a gift or bonus offer, i.e buy one get one free, half price etc the gift or bonus must also be returned. If you are unable or do not return the gift or bonus or it is not in saleable condition, the value of any available refund will be reduced by the value of the gift or bonus you have kept. Returns On Free Post Promotions - If you are returning items that had a free post offer and your returns have your order fall below the free post offer a refund or store credit is processed less the postage that would have been applied of $8.99 postage. Australia Post charge for Return to sender mail, any orders received this way will be refunded or credited less the fee at this end of $15. Purchases made in store you are lucky enough to be able to try on before purchase it is for this reason that we will exchange only for change of mind purchases.